Bill tracked down one of the country's rare herd of Buffalo to get the best quality buffalo meat for this delicious and simple redang curry. Perfect served with rice and steamed greens. Combine the onions, garlic, ginger, chillies and lemongrass in a food processor and pulse to a paste. Heat the oil in a large heavy-based saucepan over a medium heat. Add the paste plus the cumin, coriander and turmeric and cook, stirring, for 2 minutes or until fragrant. Add the buffalo steak and cook for 2 minutes, or until seared. Pour in the coconut milk and 400ml water, then add the cinnamon, tamarind paste, sugar and 2 teaspoons of salt. Simmer uncovered for 2 hours, stirring occasionally. 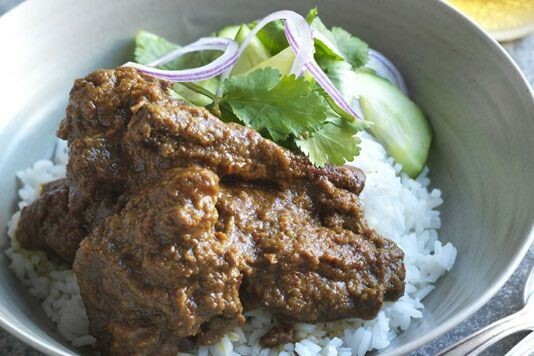 Serve the beef rendang with rice and steamed greens.